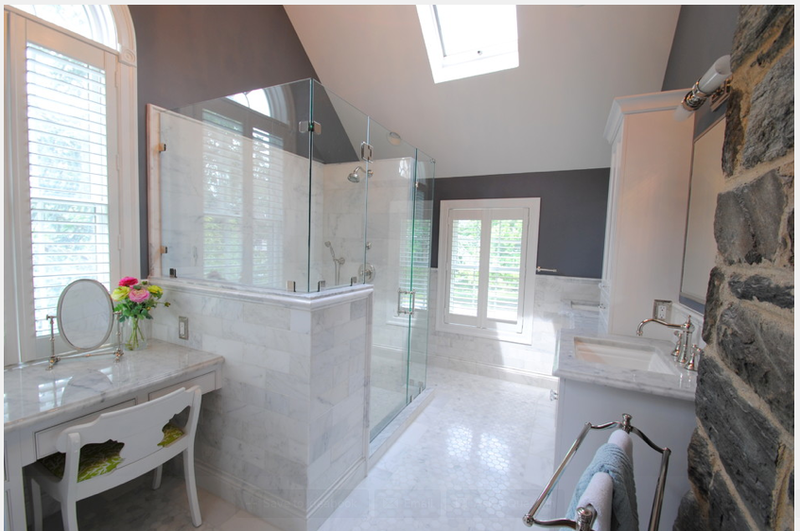 Shower and Bathroom. Bianco and Venato. This is a great mix of Carrara Venato 3×6″ Subway Tile on the wall (which is currently $7.00 a Square Foot) then Bianco Carrara Hexagon with Bardiglio edge for the flooring. They have then edged that with our 1×12″ Bardiglio Border and edged again with the 3×6″ Venato. 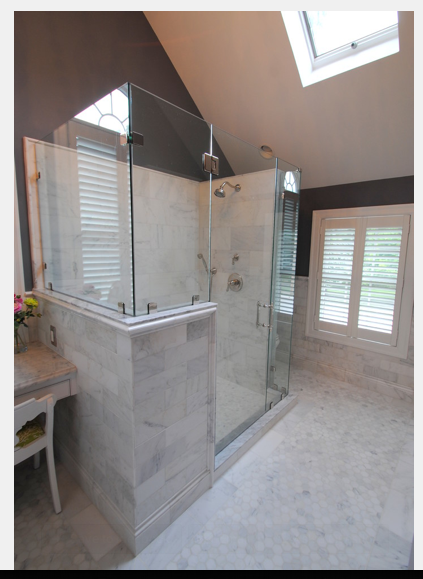 Same home following the look through they have used again the Bardiglio striped Bianco Honed 2″ Hexagon Mosaic. This is what make has made The Builder Depot unique from any other online company or even retailer. We can take pictures of the product, our product (the product that will be packed and shipped to you, it is a huge level of control in an industry that really has none). This is product that we stock. This is not stocked in a 3rd party warehouse while the person you speak to on the phone is 600 miles away sat on the 32 Floor of some “tech” building and has never seen the product or worse they are not even in the USA. The people on the phone at The Builder Depot can open the door while on the phone with you and find the product and discuss it with you. Take pictures and send them on. Match up with other sizes. All of this impossible task for big boxes or any other online retailer or Tile and Stone retailer as they just have 2-3 year old concept boards to work off. “This is one of the main reasons we are able to be a Google Trusted Store and so many competitors or companies in the similar remodeling industry cannot”. Comments David Shearn. “The ability to see the product you are selling everyday should not be underestimated in the results it drives through customer satisfaction.” he adds “How can a person in a cubicle hundreds of miles away sell a natural product or a product that they cannot physically check. You must reduce the distance from customer service to the actual product”. Companies already know this and that is why they refuse to have unbiased reviews on their website. “If you are nothing but a broker you are doomed to follow the same results as all the brokers that have come before you. Irrespective of how much Venture Capitalists, what you to “IPO” so they can “cash out”. At The Builder Ddepot we “know” what we are shipping. The majority of online companies are “Brokers” or as they do not like that name they call it “Marketplace” but it is a Broker. You buy from their website, they add 20-30-40-60% and then ship direct from the factory or 3rd party warehouse. Chaos. Absolute Chaos. Tried it before many years ago. Unless you have the product and the people all in the same facility results like this are incredibly challenging to achieve. With their customers paying the price. For us. We keep it all close. Everything is here. So we can check it off, sign off, double check. Make sure the 3×6″ goes with the 6×12″ and the pencil that you plan to put in-between matches. We can do all this because our customers communicate and we are working with the product every day. Here is the product on the Bianco Carrara Collection page, one of 70-80 different products. The largest collection of white marble in the USA, stocked and ready to ship. No third party. Just premium products warehoused with over 2.5m square feet in Alpharetta, GA. People ask “Why not add a warehouse on the West Coast”. We have been down this road before. The further the product gets from the people you speak to on the phone the less control they have over the quality and knowledge of what they are doing. It is imperative (and other companies can find this out the hard way) that the person with whom you are speaking to about your order, can physically see and touch your order. Can mark the crate as “Sold belongs to Remodelers, Inc.”. That pictures can be traded. Here it is on the product page. Price is subject to change but currently for 2016 it is $12.95 a Square Foot. (I cannot find any company that competes with this price at ‘C’ grade Italian Marble). Simple choices a Herringbone and a Basketweave. But not quite common formats. They have used a Venato 1×3″ Herringbone Mosaic Tile for the back wall $11.45 for a Square Foot (instead of the more common 1×2″ Herringbone). Then on the floor they have opted for the the 1×2″ Gray dot Basketweave Mosaic Tile $11.75 a Square Foot and Free Shipping (prices valid for 2015). 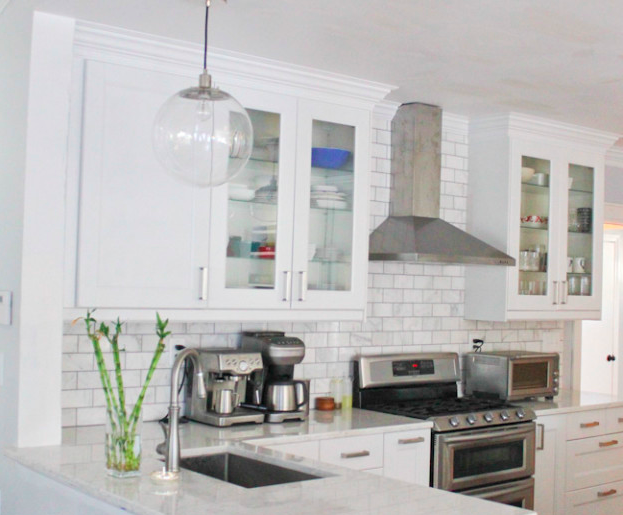 Create this whiter based looked with our Carrara Venato 3×6″ Subway Tile for $7.00 a Square Foot. Installed in a Herringbone format not the typical 3×6″ install but looks great. Carrara Venato Collection (probably the whitest based Carrara in the world). 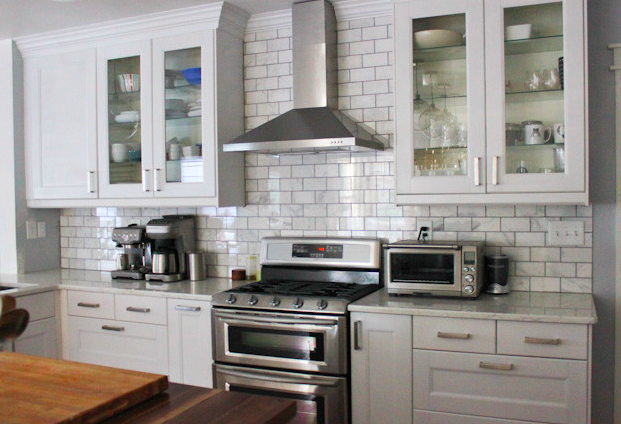 See this backsplash being created on Koko Likes Blog. Please note when you see the perfect shower or bathroom in a magazine and think “I want that” and you need 90/SF, do not order 90/SF. To get the perfect look people over order and do so significantly. They throw tiles away, they pick through, they lay it out prior to install. They create a picture a master piece. Carrara Venato 4×12″ Honed and Venato Carrara Honed 2″ Hexagon on the Floor. The Carrara Venato collection exclusive to The Builder Depot is an incredibly white based marble that a lot of people mistake for a Calacatta tile. Available in 1″ (on top) and 2″ (bottom) in both Venato and Bianco Carrara for $10.95 a piece. 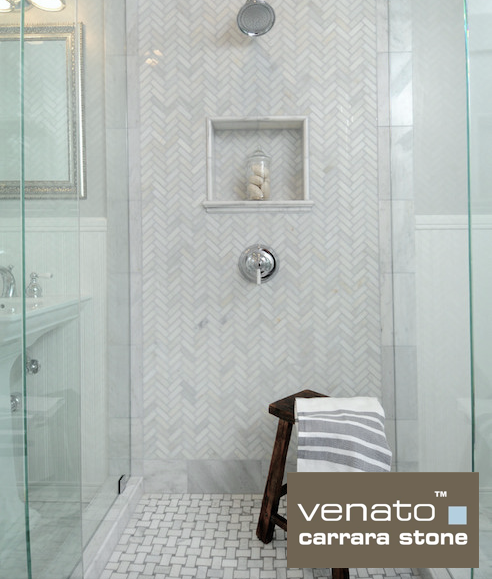 One of the most popular products we have is Carrara Venato 3×6″ Subway tile and 1″ or 2″ Hexagon mosaic. It is a great design a classic that never goes out of style. 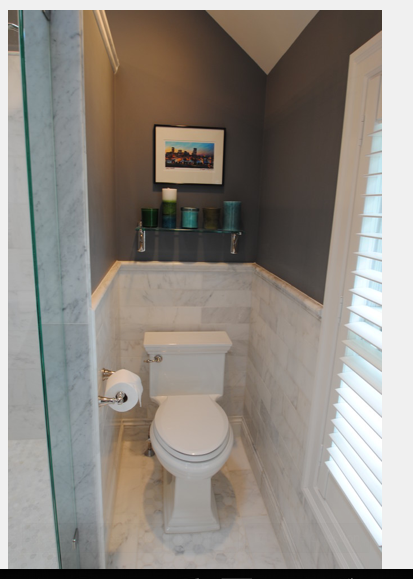 With the mosaic and subway tile along with matching chair rail and pencil bullnose trim the Carrara Venato collection from thebuilderdepot.com allows our customers to create a perfect design whether it is new construction or an authentic 1950s remodel. With a Camera phone (nothing fancy) one of our inside sales rep put together a story book process from stage 1 – the boxes to the final layout showing how matching mosaics compare with the subway tile. STAGE 1. Carrara Venato 3×6″ Subway Tile Boxes each box container 5sf (80 tiles). With just 5sf to a box and weighing 30Lbs makes installation for DIY customers easy to handle. STAGE 3. Open Box Carrara 3×6″ Subway Venato Honed. Each box is tightly packed and finished sides are protected by a layer of plastic. You can see the quality of the stone instantly – the stone is white yet there is a hint of gray on the end of each tile. STAGE 4. Carrara Venato 3×6″ Subway Tile – Out of Box and laying down the tile. There are some completely white tiles and some with veining. This is the major difference between Venato and Bianco Collections. Venato gives an overall whiter appearance. Carrara Venato 3×6″ Subway Tile Honed with Honed Crown/Chair Rail Trim mixing the white tiles with the gray veining creates a wonderful look. Carrara Venato 1″ Hexagon Honed Mosaic Tile & Carrara 3×6″ Subway Tile Honed. The mosaic is a perfect match for the subway tile. 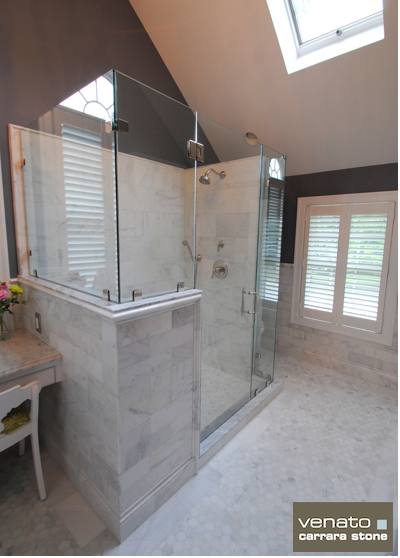 Carrara Bianco Long Octagon and Carrara Venato 3×6″ Subway Tile. The Long Octagon as it is the Bianco collection has veining on every tile but it is a nice match for the lot of Carrara Venato tile.